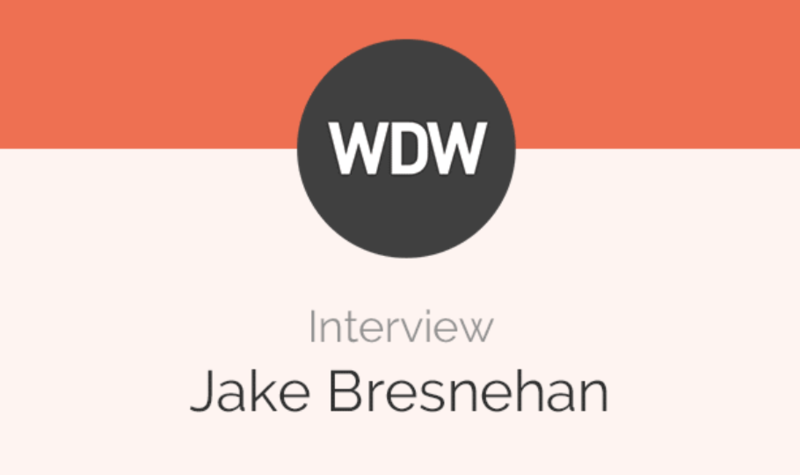 You may know of Jake Bresnehan already, but if you don’t, I’m sure you know of his fantastic email newsletter, Web Design Weekly. Jake started the newsletter back in 2011 and it has since grown into one of the best newsletters around for web designers. Q1.) What pushed you to start up Web Design Weekly? Nothing really pushed me to start WDW. I was just working in a co-working place doing a bit of freelancing in-between full-time jobs and kinda joked to my fellow work mate that it would be cool to start a newsletter. 183 issues later I’m still hitting the send button and have no intentions of stopping soon. Q2.) Do you ever feel that creative block of just wanting to watch TV or do anything but actual work? If so, what are your favourite ways to get past it? I sure do! I think being able to realise when you are not being productive is key. Being ok with stepping away is my secret. Also if I am working from home a quick run or making a fresh brew is all I need to get back my motivation. In regards to getting the work done. Sometimes you just have to start and it will be all good. Sit down, turn off all distractions, open your editor and just do it. If it’s a mundane task I try to make it fun. Like pour myself a whisky and smash emails. Emails are easy with whisky. Q3.) Are there any problems or roadblocks you face each week? For me the biggest problem is time. I work a full-time job, I have an awesome partner and I enjoy the outdoors. Thankfully early on in starting WDW I put in place some good systems to help. Q4.) What is the one thing you’d like to ask your subscribers to improve your newsletter? Q5.) What advice would you give someone looking to start their own newsletter? Make sure it’s something you really want to do. Subscribe to heaps of emails to see who is doing it well and stick to a schedule. Oh and make it fun. If you are not having fun, why are you doing it? Thanks again to Jake for doing this short interview with me and consistently putting out such a great newsletter every week. I highly suggest checking it out and subscribing if you like what you see. Running a newsletter can definitely be tricky at times, I know from experience. However, the reward of bringing content and knowledge to people that otherwise wouldn’t have come across it really makes it worthwhile. If you’d like to see more interviews, please let me know in the comments. 183 issues, whoa! Congrats, Jake! I do weekly newsletters myself, and it can be exhausting, especially when you think nothing’s worth sharing this week but you know you still have to send that issue out. Wishing you continued success with Web Design Weekly!